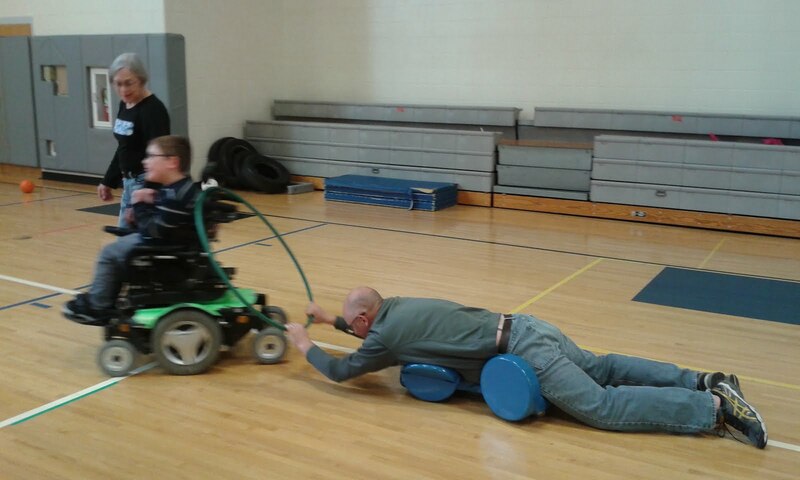 Gym teacher catching a ride! You never know what type of weather to expect in Michigan in March. This week, we had a day of mid-50's, 60 mph wind gusts and an extended power outage in our home, all in the same day. Cam was eager to hear about the loss of electricity when he returned home from school and asked what happened. Unfortunately for Jane, she migrated to a local grocery store to work, returning home at 3:30p when luckily the power was restored. Some friends of ours didn't have power until the weekend. We were very fortunate. Cam was part of a mini photo shoot when Brandon and Mike stopped by to snap some pictures of his completed bathroom for their new website. It's exciting to see our independent boy drive right up to his sink and have an easier time maneuvering through the wider doorways. On Saturday, we hosted Ms. Ann and family for a birthday celebration. Even though the temps were in the 30's, we chose to grill some steak and salmon and hot dogs. Everyone brought a dish to pass and we all enjoyed a tasty feast. Afterwards, we moved onto a frozen yogurt cake from Spoonlickers. Peanut butter and chocolate make for such a great combination for dessert. The three littlest ones in the picture are cousins, all within 1 year of each other! Pretty cool and fun to see. Cam had a good time rolling around on the floor with them. With the bigger crowd we had on Saturday, Cam decided it was time to change our dining room around on Sunday. We moved a smaller table by our window. Someone came up with the idea of this area being designated as a "diner." Now, every meal we have as a family is eaten in the diner. Upon finishing his first experience there, Cam asked "Do I get a survey?" After a busy weekend, we are always thankful for time to sit back and relax! Our Raisch family introduced us to cornbread waffles this week. Cam was pretty intrigued. Chris and his son decided to experiment. They made brownies and wanted to see if indeed you could put brownie batter in the waffle iron. In our completely non-professional opinion, this is an awesome-sauce idea! "This is not a healthy snack, but it sure is good!"